FRENCH PRESIDENT EMMANUEL Macron has set out plans to overhaul the EU in following the UK’s decision to leave the bloc. In an opinion piece published in The Guardian and 27 other newspapers, Macron outlined his vision for Europe’s future, urging reform of its passport-free Schengen area and setting up a new agency “for the protection of democracies” against cyber-attacks and fake news. It comes just weeks before the UK is scheduled to leave the EU. “Never since the Second World War has Europe been so necessary. And yet never has Europe been in such a danger,” Macron wrote. In January, Macron had suggested that the Brexit campaign – which saw Britain vote to leave the EU – was “manipulated from the exterior by a lot of what we call fake news”. Writing in his opinion piece, Macron said: “Brexit stands as the symbol of that. It symbolises the crisis of a Europe that has failed to respond to its peoples’ need for protection from the major shocks of the modern world. It also symbolises the European trap. The trap lies not in being part of the European Union; the trap is in the lie and the irresponsibility that can destroy it. Who told the British people the truth about their post-Brexit future? Who spoke to them about losing access to the EU market? Who mentioned the risks to peace in Ireland of restoring the border? Retreating into nationalism offers nothing; it is rejection without an alternative. And this is the trap that threatens the whole of Europe: the anger mongers, backed by fake news, promise anything and everything. 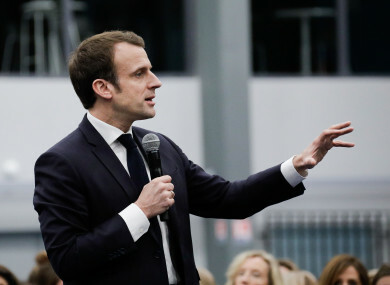 Macron, who has made no secret of his plans to form a centrist, pro-Europe alliance to stave off populist and nationalist movements which have been gaining ground across the continent, also suggested reforming the 26-member Schengen area which allows free movement between members. He also suggested Europe should also share a common border force, along with a joint office for dealing with asylum demands. Macron’s letter comes as the EU’s chief Brexit negotiator Michel Barnier is to meet with Britain negotiating team for further talks on the Irish backstop, as the clock continues to tick down the divorce deadline. The meeting comes after Barnier said on Saturday that the EU is prepared to give Britain further Brexit guarantees to help a divorce deal through the British parliament. Barnier also suggested European leaders would be open to a short “technical” delay in Britain’s departure from the EU, scheduled for 29 March, to give the British parliament time to formally ratify a final deal. His statement has raised some hope that both sides can finally reach a solution, including the Irish backstop - the biggest obstacle to agreement in parliament. In his comments, Barnier said there was “misunderstanding” over the proposed backstop deal. “Limiting it in time or introducing a unilateral exit clause would call into question its credibility,” Barnier said. Barnier is today due to meet with Britain’s attorney general Geoffrey Cox and Brexit minister Stephen Barclay for talks at 4pm today. “We’re now at a particularly critical stage in these negotiations,” a spokesperson for British Prime Minister Theresa May said yesterday. Cox’s presence today is seen as central to the meeting. This is because he will ultimately offer a legal opinion on the Brexit deal and the backstop that could determine whether key MPs in the UK parliament will approve the accord. Earlier disfavourable advice by Cox was viewed as a contributing factor in the defeat of May’s deal by MPs in January. “Cox is running the show,” a senior EU source told AFP. We are trying to find a junction between our positions and we are not there yet. Despite the defeat in January, EU leaders have continuously insisted that the withdrawal agreement will not be reopened. Talks in Brussels are focused on drafting a separate document to calm doubters in London. Also raising hopes are the softening positions of several hardline Brexit supports in May’s Conservative party who have dropped their remand that changes to the backstop be made to the withdrawal treaty itself. However, most of them are continuing to push for a time limit or exit clause to the backstop, and have set up a team of lawyers to scrutinise anything that Cox brings back from Brussels. Email “'Never has Europe been in such danger': Macron calls for EU reform in light of Brexit”. Feedback on “'Never has Europe been in such danger': Macron calls for EU reform in light of Brexit”.